The exercise band squat row is a beginner full body exercise. This is an excellent compound exercise that targets the glutes, quads, back and arms and would be suitable for any fitness level. Perform each exercise in this circuit one after another. Complete the circuit 3 times to finish the workout. This is a beginner level core exercise that targets the obliques. 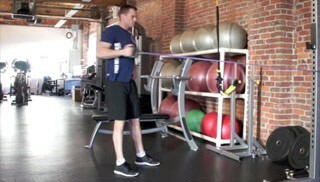 This is a core exercise that combines range of motion and balance. When done properly, this exercise works the muscles in the rear of the shoulder, the small of the back and the buttocks. Heel drops are a beginner lever lower ab exercise.